My main motivation for the trip was to go to Poland and meet the family of my girl friend, Ewa. I needed to know if I could live in Poland as I was considering marrying her. So going there and getting exposure to the culture and language was pretty important to me. I wanted to spend some time with a great friend of mine, Kevin, in Holland. I had met him in Texas, and he had been working and living in Holland for close to a year and I wanted to catch up with him. I had some graphic arts film negatives to deliver to an organization in Austria. 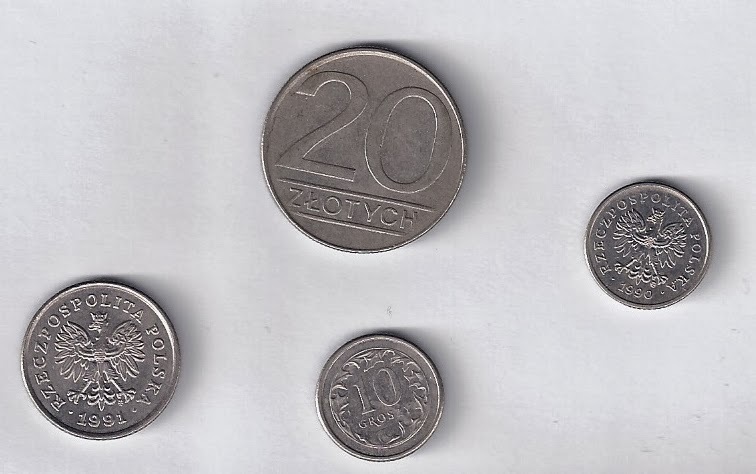 They were translating some Christian discipleship tracts into various eastern european languages and the art work for these tracts was on the film I was delivering. 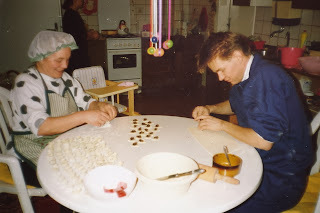 I wanted to accompany a professor of mine and visit our mutual friend Janis, in his home country, Latvia. I had worked and gone to school with him in Texas for a while and I wanted to see him in his home country. 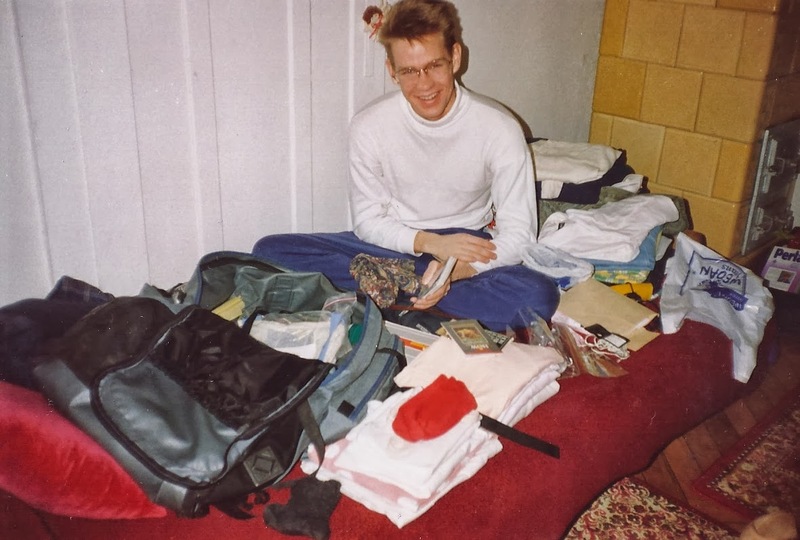 My trip lasted from the middle of December 1993 to April 1994. My plan for this trip wasn't as rigid as my India/Pakistan trip. There were certain places I had to be a certain times, but I also had several spaces of a week or two where nothing specific was planned. 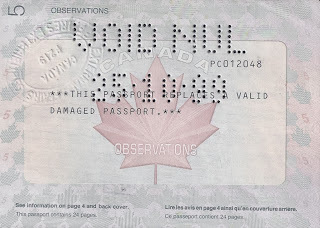 This helped me be flexible with situations like passport replacements (see below) and other travel hiccups. However, knowing where you are going to sleep is pretty important. I had a pretty good idea where I would be spending my evenings for most of the trip. Check my travel resources page for ideas on how to travel and getting a place to stay (and potentially room and board covered). I flew into London and took a train from there to Rotterdam. There was no tunnel under the English Channel back then so I caught a ferry across the channel. Arriving in Holland, Kevin picked me up with a friend of his in a Peugeot. I stayed with Kevin in Pernis, a small town on the outskirts of Rotterdam. I was there while I recovered from jet lag, then take a train from Amsterdam to Poland. 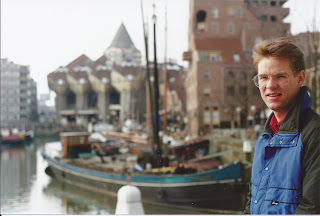 I would be returning to Holland to visit Kevin for a longer period at the end of my trip in March. While there in December, I had a great time catching up with him and meeting all of his friends. We helped some of them decorate for Christmas, and it was interesting to see the similarities and differences in their holiday tradition. I really enjoyed walking through the community and seeing how people lived there. Some houses are built right up against the sidewalk, and you could look right in the windows. Bike paths were everywhere, as were waffle stands (a great Dutch snack). I said goodbye to Kevin in Amsterdam and caught various trains to Berlin, into Poznan, Poland, on to Wroclaw, and finally to Strzelin - Ewa's home town. Getting tickets for each transfer got progressively more challenging as less people spoke English and I had to change money every time. I just about missed my transfer in Poznan as I wasn't clear on when the train was leaving and which platform it was leaving from. I didn't really have much of a chance to get settled there because two days later all of us headed further south-east to spend Christmas in Glogowek at Ewa's brother's house. Winter probably isn't the best time of year to be trying to see Europe. You have to pack more clothes and the weather isn't as accommodating. However there are less tourists, flights are cheaper, and experiencing the local culture on a big holiday like Christmas is fantastic if you have a family to be with. In Poland, the Christmas holiday goes on for several days. There is a midnight mass on Christmas eve, and to see everyone returning to their homes in the snow was really neat. I enjoyed being involved in getting the meals ready for Christmas - all part of the experience! Eye contact - when walking, people didn't make as much eye contact as I was used to. It turned out this was because during the solidarity uprising, people were wary of secret police. Avoiding eye contact was a way avoid unwanted attention. Personal space - as a Canadian, I was 'spoiled' with lots of space. Living space (apartment sizes) and personal space (in buses and trams for example) is economized in other countries. I had to get used to less. Common Courtesy - Pedestrians don't have the right of way in Poland. History is Personal - Are you from Germany or Russia? Both are (historically) countries that have invaded Poland. This adds important and sometimes negative context and perspective to any conversation and or relationship in Poland. Patience in Lines - I didn't do very much waiting in lines growing up. In Poland, waiting in lines was part of growing up. I needed to learn patience. Buying Strategies - During the uprising, many times food was in short supply. So if there was food on the shelf that you maybe didn't need right now but you might need later, you bought it now! 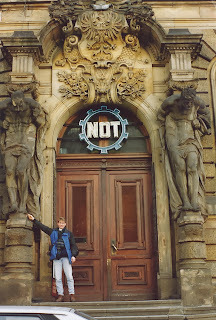 Early in January, we travelled to Warsaw so I could get Visas for my other trips. Back then I needed Visa's for my stay in Latvia and my passage through the Czech Republic to Austria. However, when I stopped at the Canadian Embassy in Warsaw to ask a question, they examined my passport and asked me to get a new one. 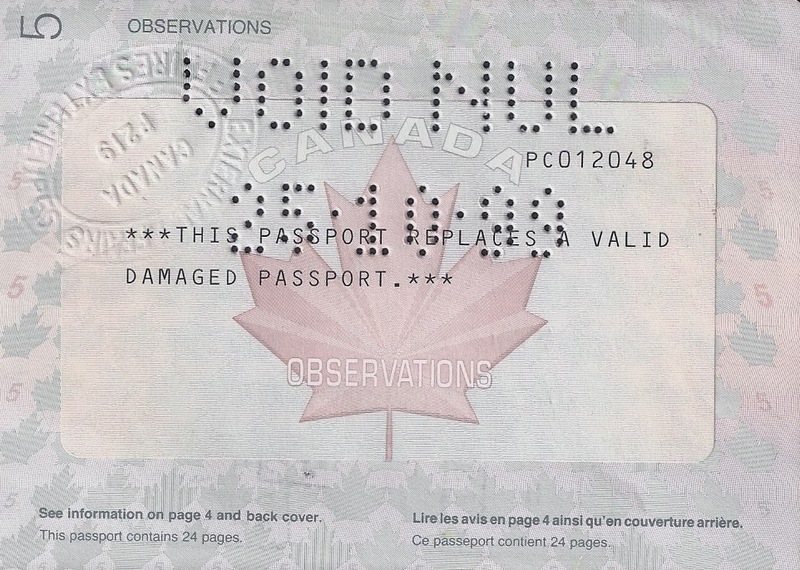 It turned out that the lamination on the ID page of my passport was coming off. They said it could look like it was faked and get confiscated at a boarder crossing. So I had to get a new passport, a new Polish Visa, and then get my Visa's for the other countries - all in a week. It kept us pretty busy. I sure was glad we had a couple of extra days in our schedule to deal with that situation. From Warsaw, I travelled with a professor of mine by bus north through Lithuania to Riga, Latvia. We were visiting a friend of ours named Janis who had lived with us in Texas. We spent a week up there and it was... cold. From there my professor travelled on to Estonia, and I returned to Poland by bus. getting around in the winter without a car. In February, Ewa and I travelled by bus from Poland through the Czech Republic to Vienna, Austria. I was delivering the graphic arts film for translations to an organization called Operation Mobilization in Spillern, Austria. We also stayed there for a week. 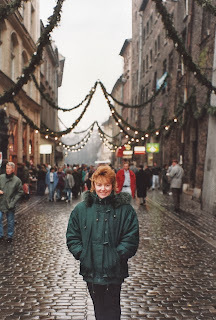 It was quite cold that week and we were mostly using public transportation to get around. I was glad I had packed the warm clothes I did, but we'd still return to our dorms with numb hands and feet. I remember going to a restaurant close to Stephans Platz in downtown Vienna, and having to coerce the waitress to serve us. The restaurant was busy and I guess it was a bit annoying that we didn't speak German. I'm not sure what it was, but we wouldn't return to that restaurant to eat anytime soon. We were pretty amazed by the municipal recycling system they had set up even back then. They were 15 years ahead of North America in that department. In the middle of March, I caught a bus from Poland back to Holland. I stayed with my friend Kevin again, and with the nicer spring weather we were able to get out a bit more. 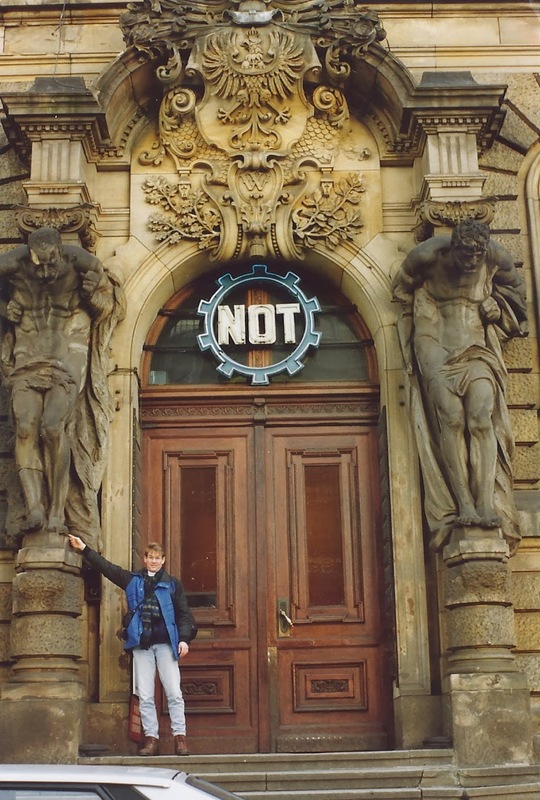 We did some biking along dikes past windmills, and spent a day in Rotterdam going to the zoo with friends and seeing the sights - including the building that my mother started her trip to Canada from when she was 7. 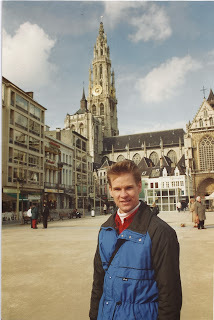 On another day, a group of us drove to Antwerp, Belgium to hang around for a day. That was a lot of fun and a bit of an eye opener - you don't have to drive long to get into a different country in Europe. And the history in the buildings in a place like Antwerp is incredible. I could have stayed there a little longer! In one of the city squares in Antwerp. Saying goodbye to Kevin, I caught a train to Calais, and then a ferry to Dover. It was quite windy and I think almost everyone got seasick on that ride from Calais to Dover. Once in London, I rented a room for two nights in the East End, and explored the city for a day before my flight left. Looking back, travelling alone is a different experience than travelling with someone. When you are alone, you are forced to make your own decisions. What you prefer, like, and don't like - bit it personalities, food, modes of transportation, living conditions - become obvious pretty fast. Travelling alone give me a better idea who I was, and who I am not. I loved the history, cultural diversity, architecture, and geographic concentration of all of these things in Europe. Personally, I'm not a fan of travelling alone. I'd rather share my experiences with somebody. Published by Lonely Planet, Volunteer is authored by 6 passionate, dedicated travellers, and 4 expert advisors. 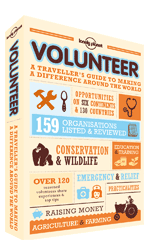 At around 250 pages and type set in the smallest font I've seen for a book, this 2013 3rd edition is jam packed with just about all the information, resources, tips, anecdotes, and advice you'd need to know if you were considering volunteering abroad. The book's 10 chapters cover almost everything you need to consider before you trip, from surveys of different types of volunteer organizations to dealing with culture shock and getting settled once you've returned back home again. If you are considering volunteering abroad, I'd highly recommend this book. This link on SlashDot.org is interesting not because of the post, but because of the following comments in the post. Lots of good advice by a variety of different people on both sides of this issue. Here's another good link posted on FastCompany. I liked this one because it helps me think twice before I watch that 'favorite movie' again. Isn't there something I could better do with what I've got during that time? And finally there some good advice if you're just starting your working career on this link on MSN. - as well as a link to my Education Links and Resources Page. 1. Become an expert at dealing with interpersonal issues. 2. Become an expert at finding or discovering problems that need solving. He calls this creativity. I would argue that building the logic in software to automate the tasks he lists will also take a lot of creativity (and people working at jobs). One of the things he alludes to in the article that I think is important is that there is a shift towards self-employment. Young people are going to need to learn how to manage their finances - not just personally, but they are going to need to know how to run their own little company. Finally, the last point he makes in his article is a bit of a switch from the rest of his content, but very important. He essentially predicts that because of technology advancing the way it is, everything will continue to evolve and change at a faster rate. Young people need to be flexible and expect to learn knew things all the time. The status quo is not the new norm - flux is. And to get around that, Don suggests a soft skill - Always be trustworthy of others. At first I though this statement was a bit ambiguous, but he clarifies it with: Live your life in such a way that others can trust you. I couldn't agree more. Not everyone knows precisely what they want to do once they graduate. Reid Hoffman spent 15 years trying to figure it out. But when he did, it worked out well for him - he's the owner/founder of LinkedIn. Here's a link to a slide show presentation he put together on some of the lessons he felt he learned through the whole process - click here to see the slide show. - How do I bring my different interested together into a career? - What should I do if I don't know what I like? - How do I choose between so many different passions? - What should I do with my life? - How do I make a positive difference in the world? he would be more concerned that everyone else is focusing on those same things, and suggests it might be better to focus on the Competitive Advantage you have over everyone else. He believes networks are important (of course he would, being the founder of LinkedIn). I do as well. Opportunities come from people. He makes this point very well in the slideshow. The conventional education system doesn't focus much on risk. However the real world is all about taking risks and learning from what happens. Learn by doing. ACTIONS, not plans, generate useful, unforgettable lessons. Taking intelligent risks will give you a competitive advantage. After going through the content of his presentation a couple of times, I still feel something is missing. It feels too much like... a rat race. To me, Neil's presentation seems geared towards being a successful businessman/entrepreneur. People with those kind of aspirations will likely find this presentation perfect for them. I believe you have to have your own definition of success. Do you have an idea of what a successful 'life' for you would be? Life beyond your career. Putting together a definition like this also takes time. Is success a journey or a destination? Does it include a family? How much stress are you willing to put up with? How will you balance financial stability with a career you dream of (that may not be as financially stable)? What does success mean to you, really? To me, that is the bottom line graduation question. 1. Mr. Kiyosaki uses examples of financial maneuvers that are specific to American tax law. One needs to have an understanding of what is and isn't possible from a tax perspective with real-estate deals before considering some of the options mentioned in the book. 2. It is important to read carefully as the author does qualify a lot of his financial suggestions with saying that he had a lot of experience and guidance. 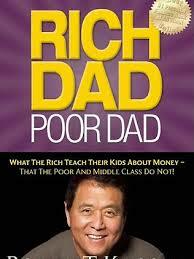 Mr. Kiyosaki is aggressive in his financial investing - meaning he is willing to accept a lot of understood risks. If you don't understand all the risks around the investments you are making, then you probably should be calling them investments. It ends up being more like gambling. The author says this himself. I totally agree with the author's philosophy on learning. He talks about it throughout the book, and because of that, I highly recommend it. Mr. Kiyosaki almost makes money sound like the 'end all be all' in the first chapter of his book - like learning the proper lessons about money is the most important thing. Do you agree? Do you think there are more important things? After you've read the book, reflect on whether or not it has influenced your view of success. Has it changed how you view or define success? Do you agree with Mr. Kiyosaki's point of view in the book? Do you think it's a balance point of view? I was very interested in what Amanda had to say about the skills shortage in her 'Connecting the Dots' brief on The National on March 29, 2013 about the future job skills shortage in Canada. I think everyone watching was waiting on the edge of their seats to hear which jobs were going to be facing skills shortages in the next few years. Even Amanda said that young people were 'in the dark' as to which jobs would be facing these shortages. Imagine my surprise (and likely everyone else's) when the clip finished without a mention of which job sectors will experience these issues! I don't know if she ran out of time (is Connecting the Dots just a 60 second byte?) and this information was edited out, or what... It seemed to me like crucial information had been omitted. This article (Hot Jobs: The Growing Divide in the Labour Market - Globe and Mail) highlights this same issue, along with (look to the bottom of the article) statistics and an actual listing of 'Hot Jobs'. The list includes: Professional engineers (civil, mechanical, electrical, chemical, IT), electricians, welders, heavy-duty equipment mechanics, pipefitters, accountants, physicians, pharmacists, nurses, therapists,medical technologists and technicians, physical sciences, and management positions that would be associated with this list. My advice for young people would be to pay close attention to this list of jobs and see where they might fit. I did that. 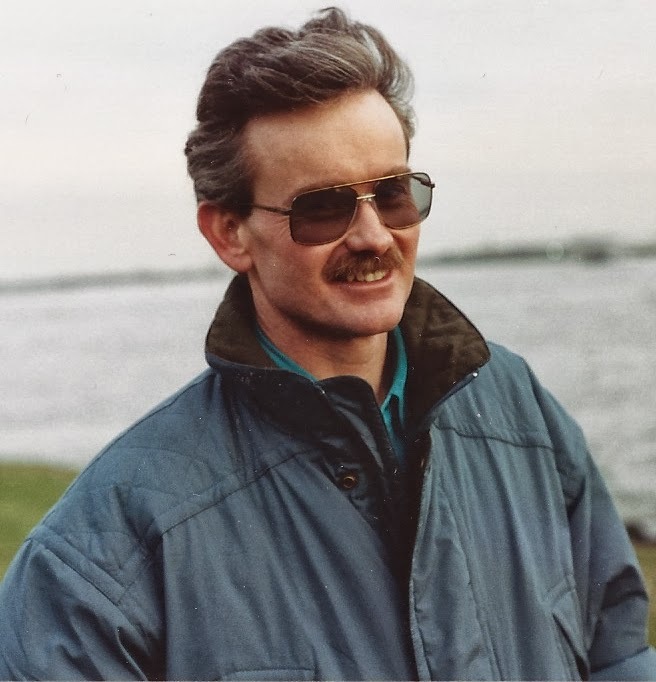 I was working as a printing pressman in 1999. I had one more promotion ahead of me before I would have been in 'job ladder limbo' for the next 20 years. My wife and I decided to sell our house so that I could go back to school and get trained in IT. I've been working in IT every since and haven't looked back. I always had a desire to travel growing up. Right after school I didn't feel quite ready to do a trip overseas on my own. I didn't know anyone overseas. 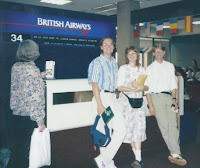 Having grown up in small town in British Columbia, I didn't think to look for resources about traveling overseas or ask for help in how to plan a trip (mind you, this was over 20 years ago and travel resources weren't so prevalent then). A couple years later, I had moved to Texas and my world had gotten a bit bigger. I had many more friends who had done some traveling overseas, and I had gotten more comfortable with traveling on my own within North America. David, Joanne, and I decided to travel together. 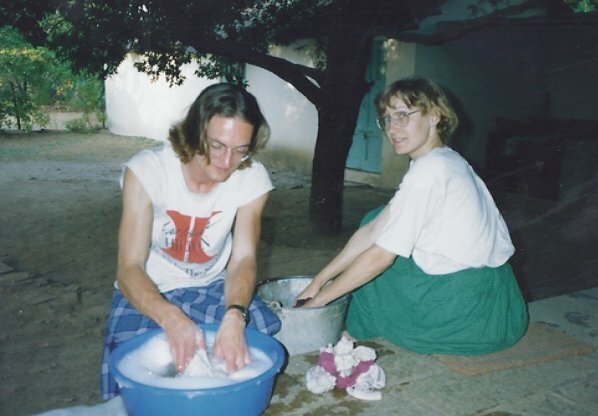 Our plan was to volunteer at various missionary bases we were affiliated with as they gave us a place to stay in return. But first there were some preliminary items to get out of the way. 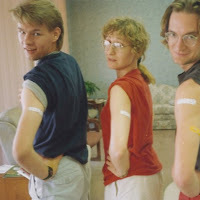 We needed immunizations and Visa's for India before we could leave. Planning your trip (at least to some degree) in advance is important. It can help you avoid getting unnecessarily sick, or having to spend a night sleeping on a bench, or getting turned away at a border because you didn't have the proper documentation. Planning is also good experience. As you execute your plan and see what works and what doesn't work you'll gain more confidence and get better at it. As a result, your trip will be more enjoyable and fulfilling. We used a guide book extensively to help us with our planning and our day to day excursions. We left DFW airport in the middle of October, 1993 and flew to London. 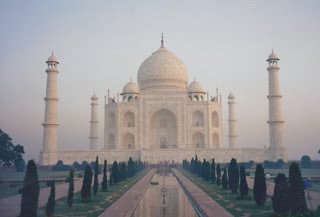 After a 6 hour layover (in which we caught a quick train downtown to see Buckingham Palace and Piccadilly Square) we caught our next flight to New Delhi. We landed in New Delhi early in the morning. 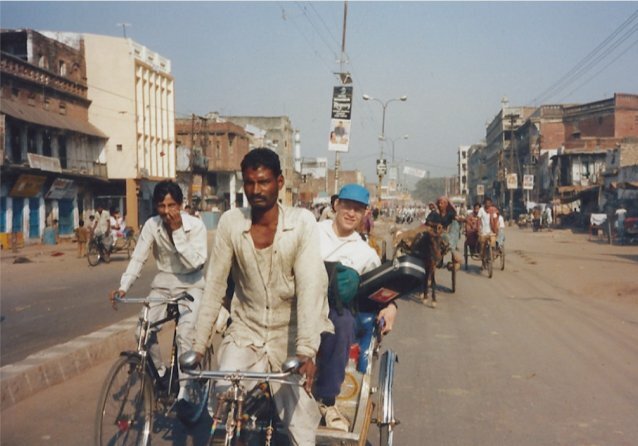 We spent our first week at a small boarding house in Jangpura, seeing some of the sights, getting acclimatized to the time zone, the food, the culture, and getting visas from the Pakistani embassy for our trip there. 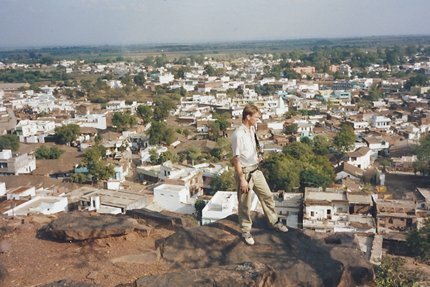 During the second week, we stayed in a conference center close to Humayan's Tomb and volunteered at a missions conference. Diwali - an Indian holiday known as 'The Festival of Lights' - happened while we were in Delhi. What an experience that was! I remember walking early in the evening from Humayan's tomb back to Jangpura with firecrackers going off all around us and roman candles being launched horizontally down the street. Even though we planned, I found I needed to temper my expectations. 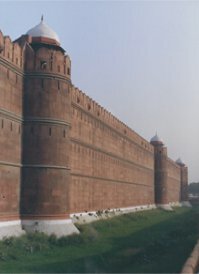 After our time in Delhi, our plan was to catch a train north to Amritsar, heading towards Pakistan. For some reason traffic on the way to the train station was terrible, and I grew very concerned that we would miss our train. It seemed hopeless with the traffic the way it was. However, when we finally got to the station, the train ended up being late departing anyway so there was really nothing to be worried about. It was an over-night trip and I was concerned about getting robbed. We had hung our backpacks in the middle of the compartment and I tried to sleep lightly that night. Sometime late that evening, someone came into the room and reached toward our backpacks. I quickly reached out and firmly grabbed their wrist. It was an armed army officer doing rounds - the light switch was under our backpacks. I felt a little sheepish, but I think he understood. In Amritsar riding on the top of the bus. 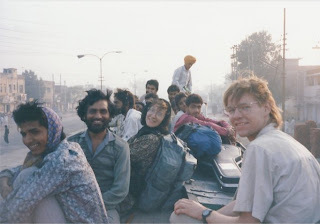 We road on the top of a bus from the train station in Amritsar to the India-Pakistan border and spent the morning going across the border to Pakistan. Once in Lahore (30 kms into Pakistan), we realized that we had forgotten our bag with passports and our return airplane tickets back at the border - travel newbies that we were. We were beside ourselves with worry as we sped back. Again, our worry was unfounded. When we breathlessly returned to the border asking for the bag the officials smiled and handed it over. What a relief! We spent a week in Pakistan, staying one night in Lahore, several nights with some missionaries from Australia in Rawalpindi, and then spending two nights with an American family in Peshawar. The father of the family we stayed with in Peshawar worked for the US Food and Drug Administration keeping an eye on the drug smuggling out of Afghanistan. from a hill in the town. Joanne had the foresight to bring along a book called 'Freedom at Midnight' by Dominique Lapierre to add some historical context to our trip. The book went through a brief history of India and then focused on the people and events surrounding the independence of India and Pakistan. It gave us a deeper appreciation for these two countries and their people. It also helped us understand the conflicts and riots that were happening between the Hindus and the Muslims while we were there, which eventually lead us to cutting our trip short. I'd highly recommend finding a book that will give some historical context to your travels. It will give you a new appreciation and perspective for the history, culture, and people of the country your are visiting. 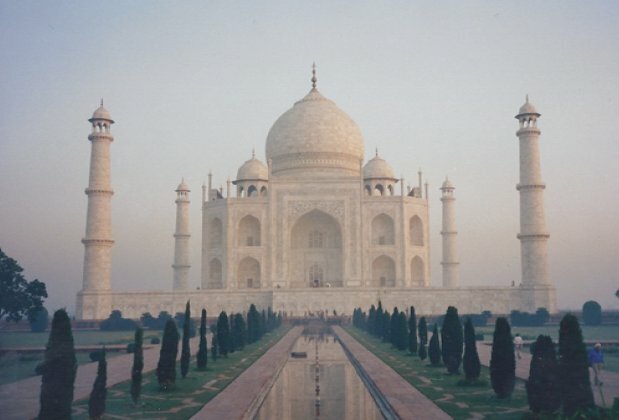 Returning to India by plane, we traveled through Agra (saw the Taj Mahal) to Kanpur and stayed there for a week. Then we took a train to Bhopal and did some volunteering in some smaller villages in the vicinity a week. I loved the food we ate there. It was mostly a chic-pea curry and fairly spicy. We ate it with naan bread using only our right hand, as per local custom. When that week was done, we hopped on the train again and spent a week in Hyderabad. During this whole time we were hearing reports about riots between the Hindus and Muslims in different cities around India, but it hadn't impacted us directly. We traveled by train to Pune after our stay in Hyderabad. It was December by this time, and because we had worked our way south through the country it was still pleasant weather. After our stay in Pune, we were supposed to catch a train into Bombay (now Mumbai). However, 4 hours into the trip the train stopped and didn't move for quite some time. After a while, we heard news that the Hindus and Muslims were rioting in the train station in Bombay and the engineer was afraid to take the train there. More than one hour passed while we waited to see which direction we would go. In the end, the train turned around and went back to Pune. Once we were back in Pune, we heard that both the Canadian and American embassies were asking travelers to leave the country as it wasn't safe with all the unrest between the Hindus and Muslims. We hastily made alternative arrangements to leave. We decided to fly into Bombay and leave that same night. On our flight into Bombay, David made friends with a fellow that turned out to be the son of a wealthy Indian movie producer. Once we landed at the airport we encountered a problem. The city was under curfew with troops on the ground keep law and order - we saw them ourselves. We had to get to the international airport and had no means to get there because of the curfew. This friend that David made on the plane apparently had special permissions though, and seeing our dilemma offered us a ride in the international airport in his chauffeur driven Mercedes. We thought it somewhat ironic that we had been going all over India in all modes of transportation and that our last ride would be in a chauffeur driven limo! Traveling gives you an opportunity to learn things about yourself. It give you an opportunity to make your own decisions and be more independent that usual. Personally, I became more confident and less anxious because of this trip. I also developed a new appreciation for history and planning. See my travel resources page for links to sites to help get you motivated. I recently did a quick read of Tom Rath's The Strength Finder 2.0. In it he suggests that people would be more effective in many areas of their lives if they focused on making their natural strengths and talents stronger rather than trying to 'fix' their weaknesses. Its an interesting thought. I loved the first sentence of the book. "At its fundamentally flawed core, the aim of almost any learning program is to help us become who we are not." There is a web site that accompanies the book, on which you can take a test to discover your top 5 'strengths'. I took the test and my top strength is Responsibility. My initial reaction to this was frustration and disappointment. I was hoping for Teaching or Mentoring. Ironically, neither of these two appear as one of the 34 possible strengths listed in the book. After a couple of days of pondering this result, I can see that I do have a strong sense of responsibility. Apparently, I have to figure out how to leverage that to my advantage. I have to say, I don't have much appetite for that right now. I mentioned this book and my test result to a friend on the bus our daily commute into work the other day. He is a production accountant in the oil industry. He laughed and told me about a career test he took just before finishing high school. It suggested that he should get into hotel management. At the time, he thought the result was a bit off the wall. Looking back now, he wonders if that test wasn't closer to the mark than he thought. It turns out his uncle went into hotel management, and ended up being quite (read very, very) successful. After continuing to ponder my results from this test, particularly my 'top' strength, I can see how it has influenced my decisions over the years - the big life changing decisions. Here's an example - I was once invited to play as a drummer in a church band that I had dreamed about playing in. They played songs I wanted to play with the level of quality that I really appreciated. However, I felt I had to decline the invitation to play because I was already committed to helping a smaller, less developed church with their music ministry. 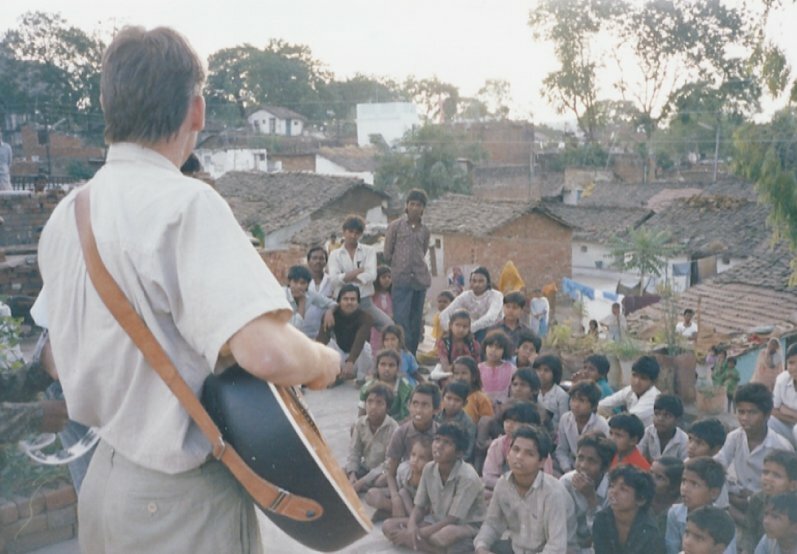 The leader of that progressive church band who had given me the invite became internationally known over then few years. I've often wondered what would have happened had I taken advantage of that opportunity instead of declining it. I am and continue to be interested in how these '5 strengths' impact and influence me. My top 5 strengths are: Responsibility, Futuristic, Intellection, Arranger, and Includer. The book talks about how to use them to your advantage. There are many times where I feel that while they are definitely at work in me and influencing my thoughts and decisions, they work against me. Sometimes, I just want a break from responsibility for a bit! For me personally in this context, probably the biggest impact on me was from my Grade 6 teacher. He told my parents that he thought I could do anything I set my heart to. Under his guidance that year I had expanded in many different ways - I took a lead role in the school Christmas play, done some detailed artwork, memorized multiplication tables up to 18x18, and memorized all the (current) countries and their capitals. I believed him and his comments still motivate me. Po Bronson has written a great book called 'What Should I Do With My Life' - true stories of people who answered the 'ultimate question'. This article (January 2003 - Fast Company) is an adaptation of that book. I enjoyed the book so much, it put my dreams for the book I've been writing on ice for a while. It was that good. Po spent 2 years interviewing over 900 people who have tried to be honest with themselves and where they 'fit'. You can find out more about the book here, on Po's website. Money is not the shortest route to freedom, and we're killing our dreams because we subscribe to this untruth. 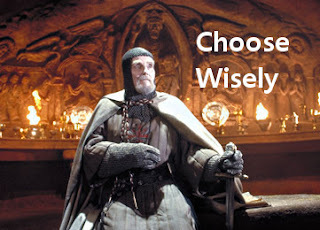 In decision making, avoid the pitfalls of leaving doors/options open as your commitment will be lukewarm. I bumped into an interesting article on MacLean's OnCampus website. It suggests making the first year of college or university free for students so they can 'test' out post secondary education. The author, Todd Pettigrew, bases the article on a study that concludes students aren't prepared for the challenges and rigor of a post secondary education. I'm conflicted as to whether this is a good idea or not. I do agree that young adults who aren't sure if they are ready for post secondary education should consider testing it out. I don't think I agree with a whole year of education as a free hand out. Education isn't all about what you learn in classes or labs. I believe that part of the post secondary educational experience is learning to manage your money, learning to know if you are ready for more formal schooling or not, and learning to be responsible for your own decisions. It's the best, most practical kind of learning. Besides, who is going to foot the bill for all of these first year students with the governments running deficits like they are? Personally, I did one year of college directly after high school that I paid for myself - out of money that I had saved and earned on my own - and I realized that I wasn't ready to continue with more schooling for while. 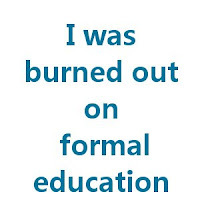 Frankly, I was burned out on formal education. I had been very busy with extra curricular activities in high school along with my course load, and I was tired of being lectured on theories of 'the way things are' without a practical application. I had to discover some of those things for myself. I needed to travel and have 'hands-on' learning experiences for while. Everyone is unique. Some people are ready for post secondary education right out of high school and it's not a problem for them. Others, like me, are not. If the tuition of a full year is a concern for you if you are considering 'testing out' a post secondary education, cut your costs in half by starting with a single semester! No one is saying you have to take a full year. In the end, I guarantee you'll learn more powerful lessons if you make and pay for this decision on your own. Here's one of the ways the traditional college model is changing. More students are realizing they can achieve a college degree on-line, coupled with real life experiences, and save the time and expense of attending a 4 year institution for a diploma and a boat-load of debt. Go to www.collegeplus.org to find out more. Another challenger to the traditional college education is Minerva Schools at KGI. Classrooms are in a different city every year. Tuition is capped and every qualified student is accepted. Courses are given online in a seminar format and limited to 19 students (so you can't fly under the radar). Also, don't forget to check out our 'Education Resources for High School Graduates and Young Adults' page for more links to post secondary education resources.